The main view of the Channels plugins shows Wi-Fi channels across the top; from lowest to highest frequency. All 2.4 and 5 Ghz bands are concatenated together and displayed one scan at a time vertically, with the most recent scan at the top. Darker channels have fewer APs on them. Shows a grid of Wi-Fi Channels over time and color codes each square in the grid with the channels rating. Higher density samples are darker and will have more Wi-Fi traffic. 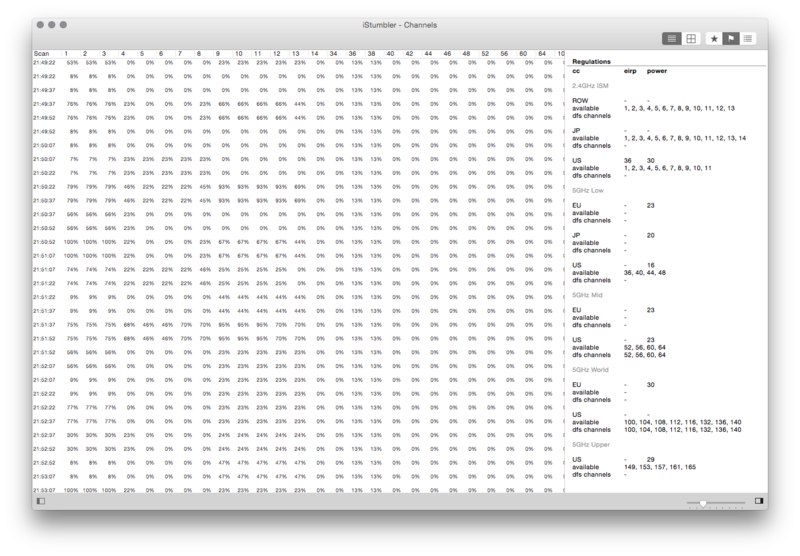 Shows a table of Wi-Fi Channels over time and displays the score for each scan in a table. Quick reference to different Wi-Fi regulations and areas, includes eirp and power limits for each regulatory area, as well as listing available and dfs (dynamic frequency selection or radar) channels per band. Shows the details of all the samples taken of the selected radio.